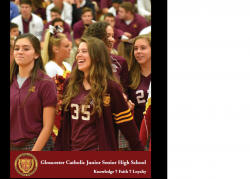 Gloucester Catholic Junior Senior High School – Senior Class of 2018 Academic Success Stories: Discover Our Talented Students! Home / General News / Senior Class of 2018 Academic Success Stories: Discover Our Talented Students! Senior Class of 2018 Academic Success Stories: Discover Our Talented Students! Members of Gloucester Catholic’s Class of 2018 will soon graduate, and these talented seniors have chosen their future paths for college. Read about their Academic Success Stories below, as the Administration, Faculty and Staff members congratulate these exceptional future leaders of society! Kaitlyn Allison began her education as a Ram in our junior high and has been an honors student each year. 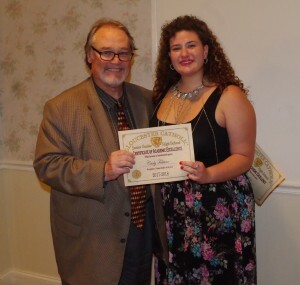 A Gloucester city resident and a member of St. Mary’s parish, Kaitlyn is a member of our National Honors Society and was recently named “Best Overall Student” for Camden County. Kaitlyn is also an accomplished, multi-sport athlete having participated as a member of our softball, basketball, tennis and field hockey teams.She is also a dedicated Religious education teacher, volunteers at the cathedral soup kitchen and was a Kairos leader. Kaitlin has been accepted to St. Joseph’s University and the University of Delaware. She will attend Seton Hall University to study Biology and Physical Therapy as a recipient of the Public Rate Tuition Scholarship. 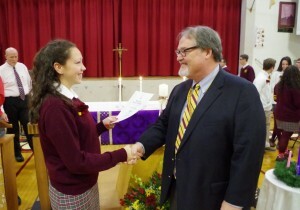 Emma Billings hails from Gloucester City and is a graduate of our junior high and a St. Mary’s parishioner. Emma has been an attendee at this event every year since she started at GC as a 7th grader! She is a member of the Marian Chapter of the National Honor Society and an avid swimmer. While at GC, Emma has been a member of our swim, lacrosse, and tennis teams and has helped plan her junior prom and senior homecoming. Accepted to and offered scholarships in the amount of $281, 368.00 to East Stroudsburg, Rider University, Arcadia, The College of New Jersey, Lockhaven and Kutztown, she will major in Special Education with a concentration in Social Studies at East Stroudsburg University and swim competitively as a Division 2 athlete. Laura Blaston is a graduate of St. Margaret’s School and is a member of Holy Angels Parish. Actively involved at GC , Laura has been a member of our diving team for four years and earned All Tri-County Honors. She is a member of our National Honors Society, plays on our varsity tennis team and was a Kairos retreatant. Outside of school, Laura is an accomplished gymnast and has won a state championship in the floor exercise and vault. 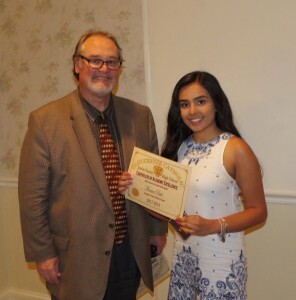 Both an NJ Scholars Nominee and a US Presidential Scholar Nominee, she also finds time to volunteer at the South Jersey Food Bank, Voorhees Acute Pediatric Center and has been a team leader for the MS Muck Fest. Laura has been accepted to St. Joseph’s University, Widener University, Seton Hall University, University of Scranton and Philadelphia University earning $426,500 in scholarship money. 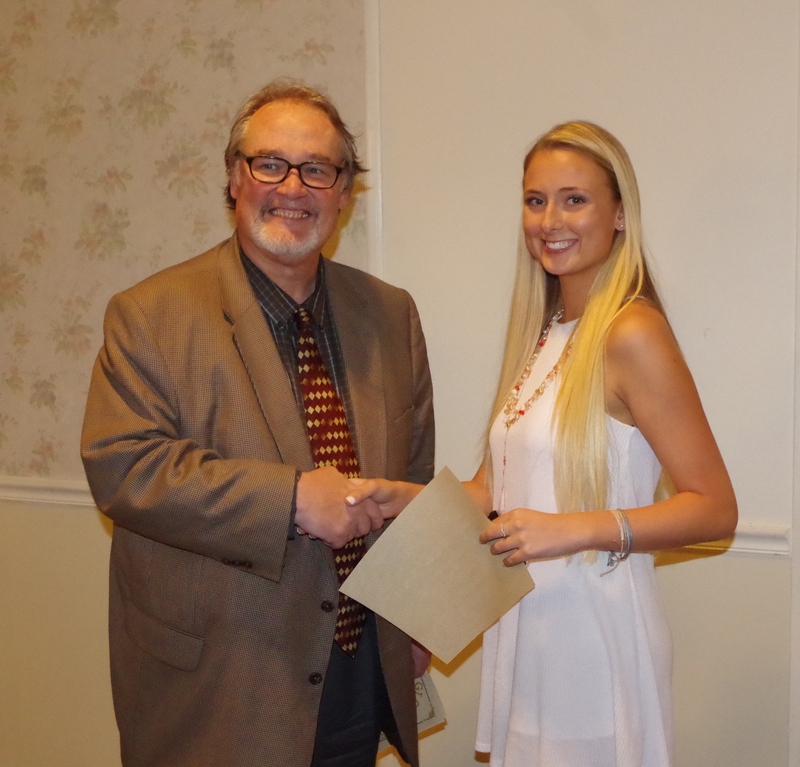 Laura will study Psychology at Villanova University in the fall. Chase DiMauro is a graduate of Gloucester Catholic Junior High School and has played hockey for the Rams ever since entering the halls of GC. Chase is a member of Our Lady of Hope Parish and resides in Franklinville. Chase volunteers many hours at the rink sharing his time and talents in the hockey realm with young, up and coming players. 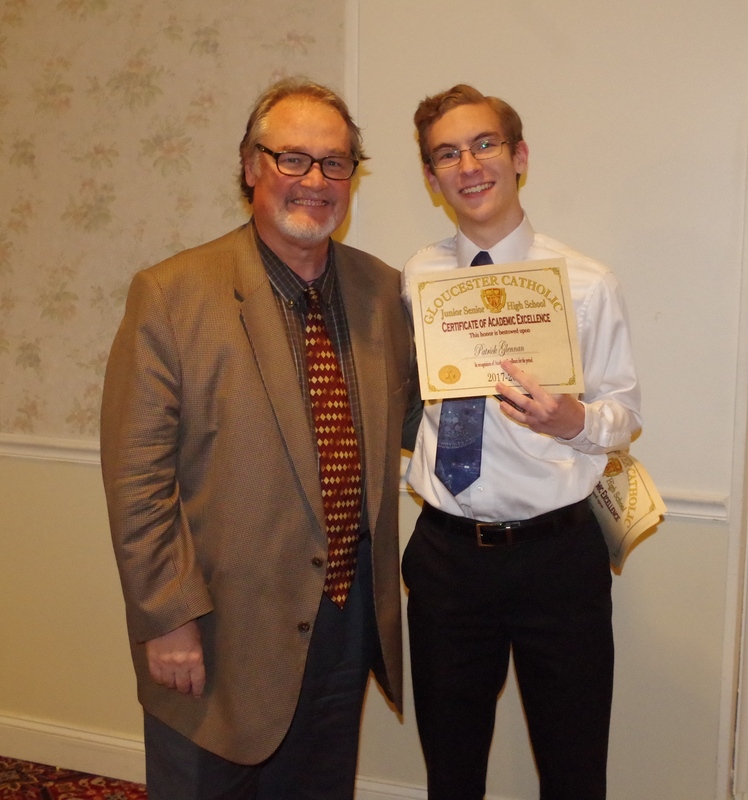 His college acceptances include Rowan University and LaSalle University. Chase is excited to accept an academic and athletic scholarship to attend Drexel University in the fall to study Business Analytics and play ice hockey for the Dragons. Renel Forand came to GC from Guardian Angels School and is a resident of Paulsboro and a parishioner at St. Claire of Assisi. A member of the National Honors Society, Renel often tutors underclassmen and has dedicated many hours helping out in the Guidance Office. She also volunteers at an aftercare program and has worked with her local girl scout troop as a mentor. A varsity cheerleader and lacrosse player, Renel was named captain for both teams. Accepted to University of South Carolina, Immaculata, Johnson and Wales and Albright, Renel will study Fashion Design and Merchandising at Jefferson University. Carly Fultano resides in Clementon, is a member of St. Simon Stock Parish and also attended GC Junior High. Carly has participated in Teen Arts while at GC and serves on our stage crew and tennis team. She was a Kairos retreat Rector, a huge endeavor which places the responsibility for planning and implementing this student-led retreat. She has attended our annual leadership camp and volunteers extensively for animal welfare, the soup kitchen and as a religious education teacher. Carly has been accepted to Rutgers University, Neumann University, and LaSalle University. She will attend Seton Hall University studying Occupational Therapy. Residing in Washington Township and a member of Holy Family Parish, Evan Giordano attended Bunker Hill Middle School. Evan is a four year attendee at our honors banquet and is a member of our National Honors Society. An avid participant our school community, Evan is a four-year student council representative, was a Kairos 4 retreatant and can boast that he was a member of our 2017 State Baseball Championship team. 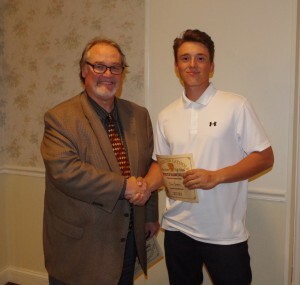 Evan will be attending Stony Brook University in the fall where he will study Finance and play baseball on academic and athletic scholarships. Patrick “Patch” Glennan is an Incarnation parishioner and a GC Junior High graduate who has earned honors for the past 6 years at Gloucester Catholic. At GCHS, Patch was a member of our Cross Country team and Forensic team. 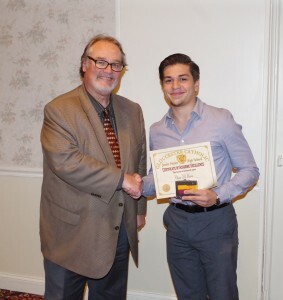 As a member of our Forensic team, Patch placed first in the diocese in the category for Extemporaneous Speaking, which allowed him to compete nationally in Sacramento, California. Traditional Irish music is both a passion and a business for Patch as he and his father can often be found playing at local venues, teaching students or playing at our school masses. Patch also attended the American Legion Boys’ State program. Most impressively, Patch has earned the distinction of being named a National Merit Scholarship Finalist; only 15,000 students in the entire country reach this level and he is the only student attending one of our diocesan high schools to earn this status. Patch will study Biology at the University of Pennsylvania in pursuit of a medical degree. Emma Holian resides in Deptford and is a parishioner at Our Lady of Guadelupe. 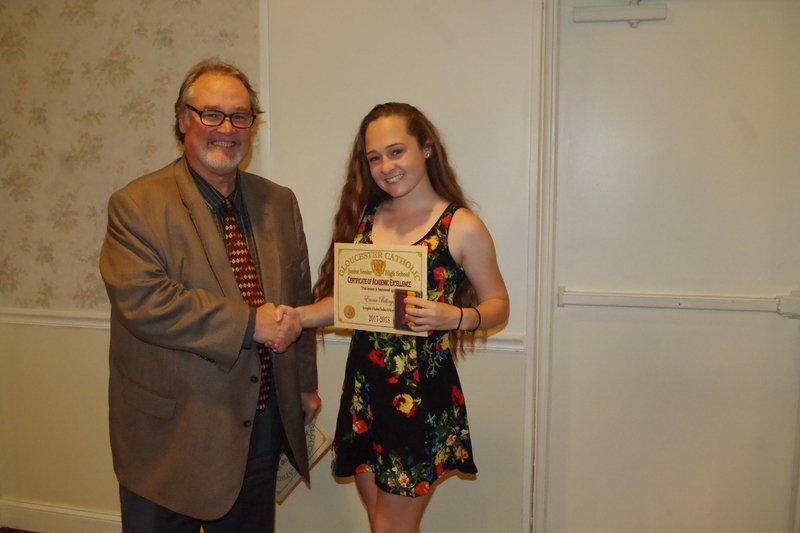 Emma is a vital member of our girls’ soccer program and is a four year student council representative who was voted by her peers to lead as our Secretary/Treasurer for the 2017-2018 school year. Emma has volunteered for St. John of God and has participated in the March for Life. Accepted to the University of Delaware, James Madison University, Rowan University, St. Joseph’s University, LaSalle and Penn State University, Emma will attend the University of South Carolina to study Risk Management and Law with a scholarship of distinction. Senior Class of 2018 Academic Success Stories: Garrett Lugiano! Garrett Lugiano came to GC from Bishop Schad Regional School in Vineland. He is now a resident of Deptford and a member of St. Mary’s Parish in Gloucester. 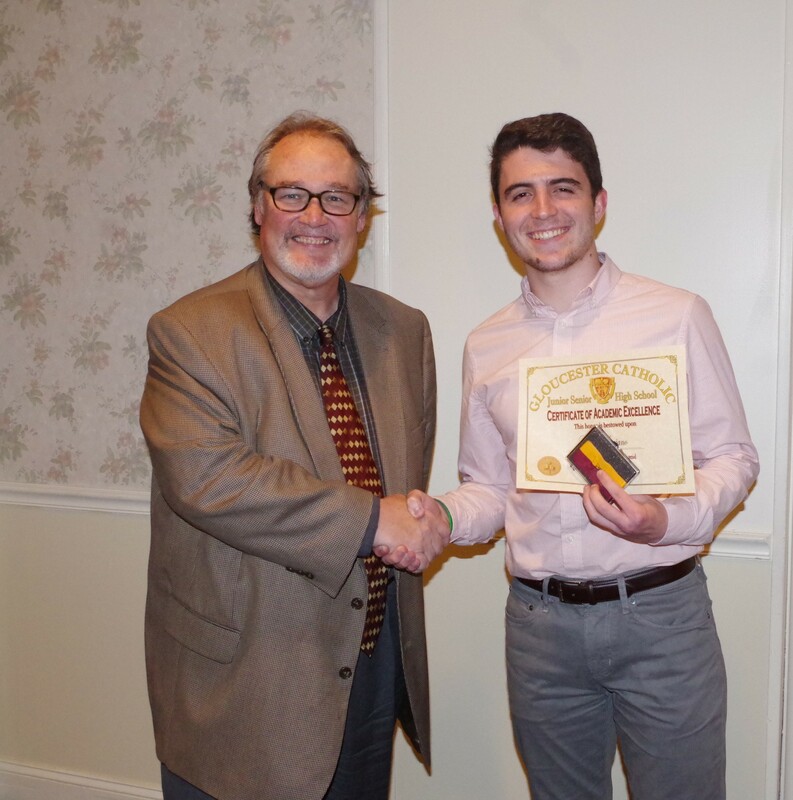 A winner of our annual writing contest, “What Makes Gloucester Catholic, Catholic” Garrett has also been selected by the state of New Jersey through Teen Arts to receive accolades in both writing and art. A member of our swim, lacrosse and basketball teams, Garett was also a member of our Lady Rams practice squad. Garrett has served the greater good through his work with the Big Brothers and Big Sisters organization and was a two-time Kairos leader.Accepted to Widener University, East Stroudsburg University, Alvernia, Gwynedd Mercy, Misericordia and Rowan University, he will attend Seton Hall University having earned a full tuition scholarship to study Creative Writing. 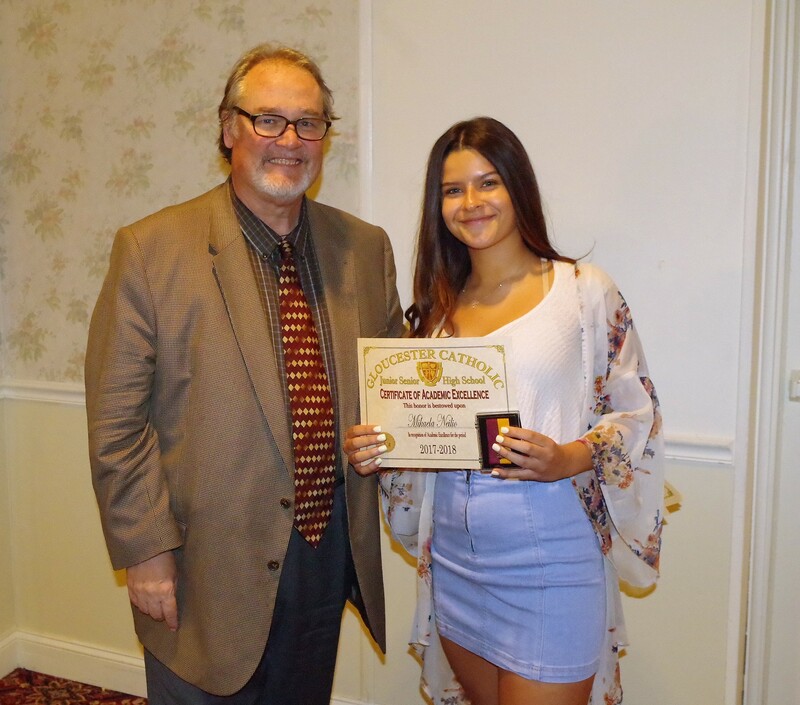 Mia Lugiano is a resident of Deptford and a member of St. Mary’s Parish who attended elementary school at Bishop Schad Regional School in Vineland. Mia plays a very active role in our school community having been selected as a Kairos leader, a national honors society member, a student council representative and 4-year varsity soccer player. Mia has dedicated much of her service in aid to the Big Brother and Big Sister organization and has been a volunteer at our annual Johnny Gaudreau Hockey tournament. 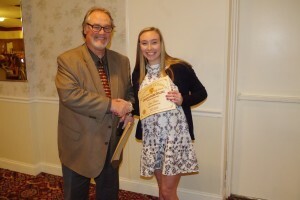 Receiving acceptances and scholarships in excess of $1.1 million dollars to East Stroudsberg, Holy Family, Misercordia, Widener, Monmouth, LaSalle, Gwynedd Mercy, Seton Hall, and Fairleigh Dickenson, Mia will study Nursing and play Division II Women’s Soccer at East Stroudsburg University. 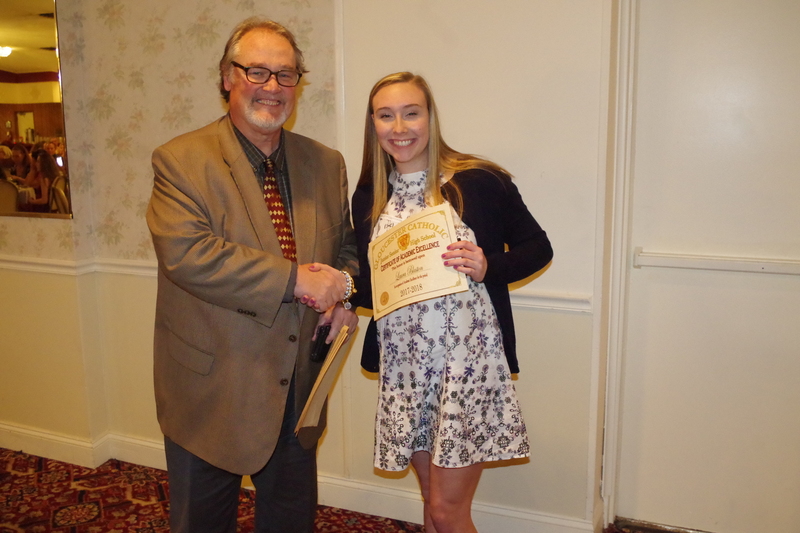 Senior Class of 2018 Academic Success Stories: Meghan McGonigle! Meghan McGonigle lives in Mullica Hill and is an active parishioner at the Catholic Community of the Holy Spirit. 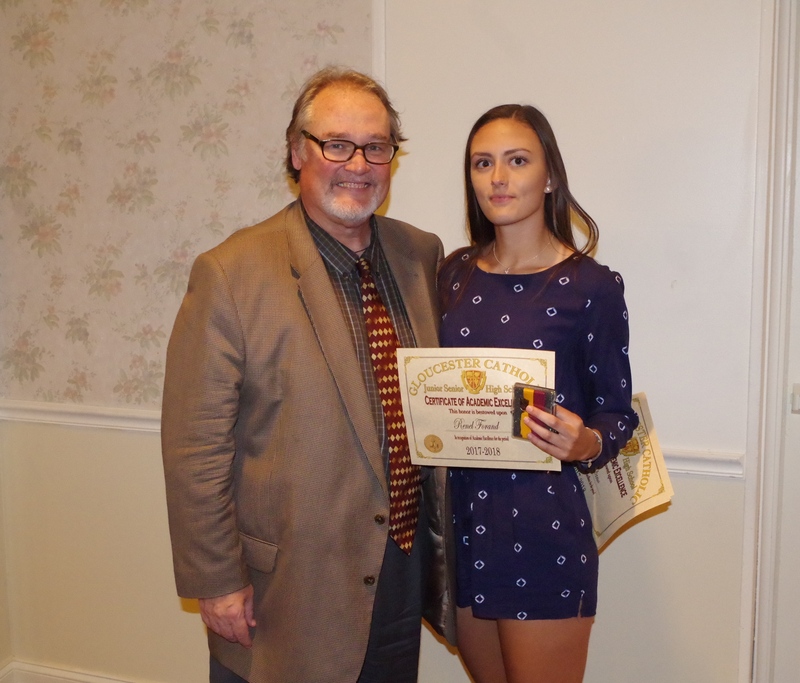 Coming to Gloucester Catholic from St. Margaret’s, Meghan quickly became involved in our athletic programs as a standout soccer and track athlete. Meghan won the South Jersey Championship in the high jump as a junior. Not afraid to try something new, Meghan bowled her junior year and was named Most Valuable Bowler for the Rams. Elected by her peers, Meghan served as this year’s Student Council Vice President and was a member of our National Honors Society. Meghan has volunteered for four years for the Summer in the City program, works with students at St. John of God and was a Kairos 6 leader. Meghan received acceptances to Misericordia, St. Francis, Jefferson, Alvernia, Duquesne, Seton Hall and LaSalle. Having received an academic scholarship Meghan will attend The University of Scranton in the fall where she was accepted into a 5-year Occupational Therapy BA/Masters program and she will be a member of their track team. Senior Class of 2018 Academic Success Stories: Camryn McHugh! 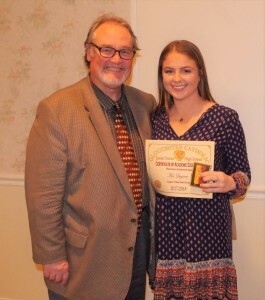 Camryn McHugh is a disciplined scholar athlete who resides in Sicklerville and is member of St. Charles Borremeo parish and who attended Our Lady of Hope. Camryn is a member of the GCHS National Honors Society and is a student council representative. 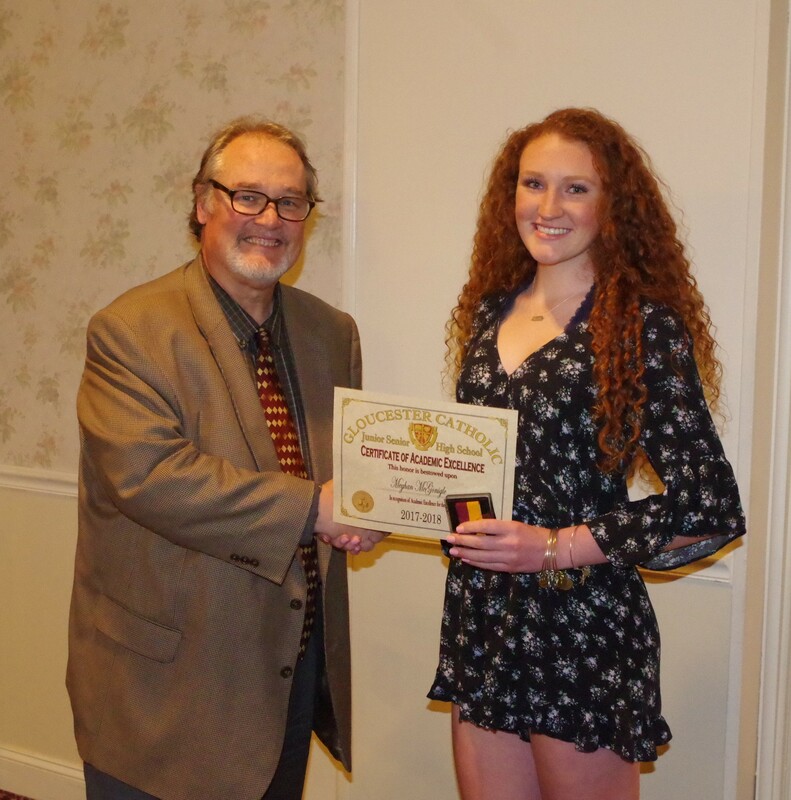 As one of Gloucester Catholic’s most accomplished female swimmers, Camryn spends countless hours in the pool resulting in many school, county and club records for the Greater Philadelphia Aquatic Club. When not in the pool, Camryn works at Trump National Golf Club, and volunteers her time with younger swimmers, is a teacher’s aid and works to clean up beaches with Project Green in Atlantic City. Her college acceptances include Wagner University and Drexel University. Camryn will attend Monmouth University to study Business, having received a full scholarship for athletics and academics. Senior Class of 2018 Academic Success Stories: Mikaela Neilio! Residing in West Deptford and a member of Holy Angels Parish, Mikaela Neilio attended Holy Trinity School before coming to Gloucester Catholic. Mikaela has excelled academically in her senior year. 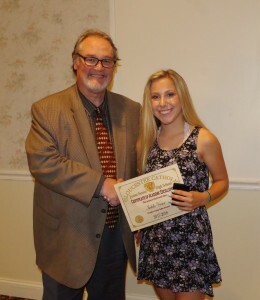 Hard-working, independent and determined, Mikaela achieved principal’s honors this year. Mikaela has also been a vital member of GCHS’ successful girls’ basketball team for 4 years and volunteers her time in her parish school, Holy Angels, working in the aftercare program with the students. Accepted to The University of Alabama and West Virginia, Mikaela will attend Rowan College at Gloucester County in the fall. Senior Class of 2018 Academic Success Stories: Monica Patel! Monica Patel is a four-year attendee of our honors banquet. She resides in Somerdale and attended Our Lady of Hope School before coming to Gloucester Catholic. 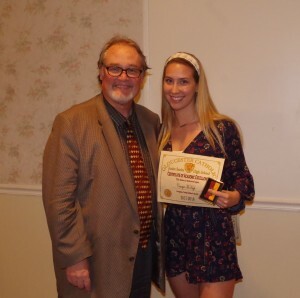 Monica is a leader as the captain of our Lady Rams Volleyball team, was a member of the bowling team and was inducted into our National Honors Society. Monica volunteers her time at Virtua Hospital and The Camden County Library. Accepted to Jefferson University, Temple, Seton Hall, Massachusetts College of Pharmacy and Health Sciences, and Rutgers, Monica will attend Drexel University studying in a 5-year accelerated Physician’s Assistant Program. She accepted a scholarship package over 5 years for $190,600.00. Senior Class of 2018 Academic Success Stories: Trey Scull! Trey Scull is a Mullica Hill resident and attended Clearview Regional Middle School before coming to GC. Passionate about both academics and hockey, Trey has been a key member of our Rams Hockey Team and plays club hockey for the Hollydell Hurricanes. 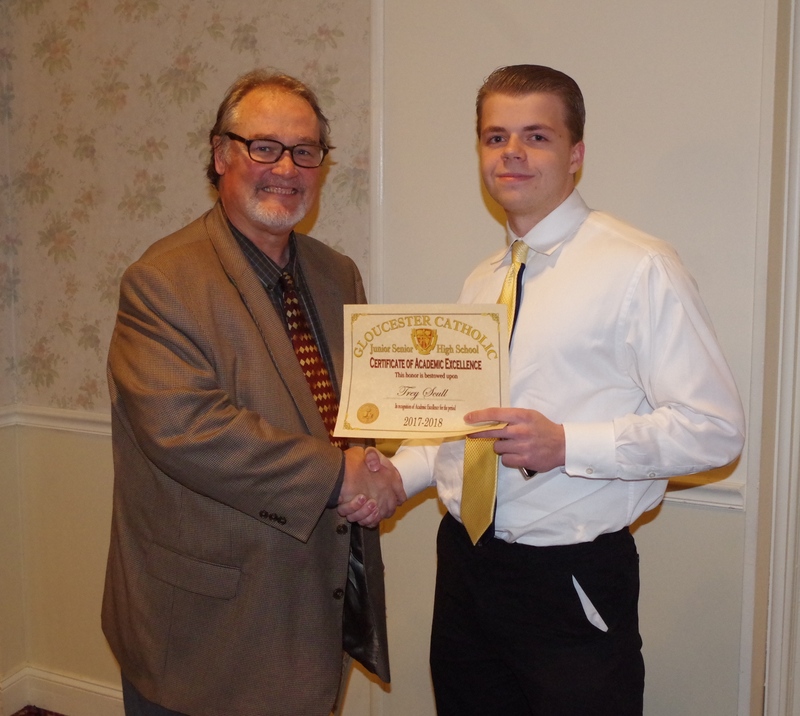 He has volunteered at the Cathedral Soup Kitchen and is a member of our National Honors Society. Trey is also the owner of his own e-commerce business through ebay. 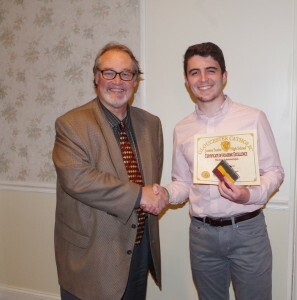 Earning scholarships over four years in the amount of $220,000.00, Trey has been accepted to Drexel University and Catholic University of America and will study Finance at Rowan University in the fall. Senior Class of 2018 Academic Success Stories: Isabella Versace! Isabella Versace lives in Sewell, attended Gloucester Catholic Junior High and is a parishioner at St. Mary’s. Isabella is a vibrant member of the GC Community. A multi-sport athlete who participated in Lacrosse, Cheerleading, Tennis and Soccer, she has been named team captain in lacrosse and cheer as an upperclassman. Isabella is also the Secretary of our National Honors society and has been at the honors banquet every year.She also serves her community through outreach in the Camden Kid’s Academy, is a Hope for Ella volunteer as well as spending time for the cause Mumms and Mutts in South Philadelphia. Accepted to Penn State, Drexel, University of Pittsburg, Immaculata, Rowan, Clemson, and University of Alabama, Isabella will attend University of Florida as a Pre-Med major.